The son of Frankel entered the recent Prince of Wales stakes having not tasted defeat since July of 2017. In this period he had firmly established himself as one of the top horses in the world. He returned in the Prix Ganay back in April and put in a top performance to clear away and win by 4 lengths looking as good as ever. His reputation has always been extremely high due to his connections and of course his fantastic pedigree. Cracksman was then sent to Epsom for the Coronation cup and sent off at prohibitive odds of 2/7 as he had a lot clear on ratings with many punters backing the horse with a coral promo for example. Cracksman never looked comfortable at any point but battled on gamely to get up on the line ahead of the unlucky Salouen. This run was way below the horse‘s best but could be excused considering the horse clearly shows a disliking to the track and the running downhill. This was still a very poor performance from a horse considered the 3rd best in the world and would had previously destroyed a high class field in the Champions stakes back in October. Following this result the horse was pushed out to around 3/1 before being supported back in. On the run up to the Royal Ascot contest the horse was showing all the right signs according to connections and they were hopeful he could return to his best. This was shown in the betting as he continued to be supported heavily with bookmakers fearing the worst and he was sent off at odds of 2/5. Returning to the track of his most impressive performance was a further reason why punters believed the horse could not be beaten and was the so called banker of the 2018 Royal Ascot. Prior to the race his trainer John Gosden voiced a little concern that the horse seemed more interested in the fillies passing him from the previous race. This concern came to fruition as the horse clearly did not have his mind on the job and was never travelling in the contest. His jockey Frankie Dettori was bumping the horse along on multiple occasions and turning in he did look to have a chance as he picked up the two front runners. The eventual winner Poet’s Word travelled ominously well out the back and came cruising along Cracksman before putting the race to bed and clearing away to winner ever so impressively. This was a long due group 1 success for the horse, as he had placed on several occasions at the top level around the world. 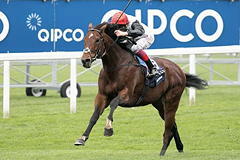 So what next for Cracksman? His trainer did say that the best of the horse would be seen at the latter stages of the season but he clearly has not been the same horse in his most recent starts. His next target is still likely to be the King George in which he is the general market leader. The ground could likely play apart as his top performances have been on a softer surface so connections will likely be hoping for some rain on the run up to the race. His key end of season target will be the Arc as he tries to emulate his trainer’s recent winners. This could also set up what was the most anticipated clash of the season between the stables Enable and Cracksman. However both horses now have questions to answer will the lengthy lay off for the filly and poor runs for Cracksman so it is going to take a masterful training performance to get one of them to land the Arc for the Gosden stable.